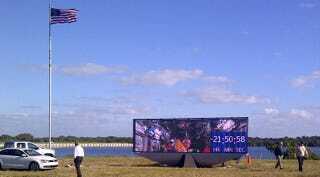 In anticipation of its new deep space explorer, NASA has unveiled a sleek countdown display at the Kennedy Space Center in Florida. The modern, digital LED display is replacing the iconic analog countdown clock. The new display, which resembles a stadium monitor, is similar in size to the historic clock. It features a screen nearly 26 feet wide by 7 feet tall. The display isn't true high-definition, but its video resolution will be 1280 x 360. At a cost of $280,000, it will provide images from multiple sources, as well as the countdown launch time. Streaming video will also be an option. Indeed, the new display is significant advancement over its predecessor. Instead of just featuring numbers, NASA's entire prelaunch program will be shown. And,if the numbers stop counting down prior to a launch, those following won't have to wonder whether it's a built-in hold or a technical glitch with the rocket — the display will be updated with relevant updates. As for the old clock, it was disassembled last week, but its place in space history is secure. The former countdown clock earned its place in space lore as an icon familiar to everyone who watched an Apollo or shuttle launch on TV. Media members and visitors took thousands of pictures of themselves in front of the clock as proof of their pilgrimage to the Florida spaceport. The clock was even the centerpiece of several Hollywood scenes, the 4-foot-high, 2-foot-wide numbers helping add tension for the audience as a launch drew near. "It is so absolutely unique — the one and only — built for the world to watch the countdown and launch," Wright said. "From a historical aspect, it has been very faithful to serve its mission requirements." The countdown clock became part of the Kennedy landscape during the Apollo era. It ticked off the progression of launches ranging from moon landings to Skylab crew launches to the historic liftoff of the Apollo-Soyuz mission in 1975 that saw NASA and the Soviet space program connect in space, a presage of the cooperation in full effect now in the form of the International Space Station and its crucial research. All the space shuttle missions and scores of planetary probes and Earth-focused observatories also lifted off in the background of the steadily clicking clock. While launch days were clear, the clock structure took a beating from the Florida weather on more than one occasion, including sustaining damage from three hurricanes in 2004. In another parallel to the transition into the next space age, the older display could not be sustained and there was not going to be a better time to replace it than when the whole of Kennedy is transforming into a spaceport of modern infrastructure and abilities. The new countdown clock will perform its inaugural duties on December 4th, when Orion is launched.